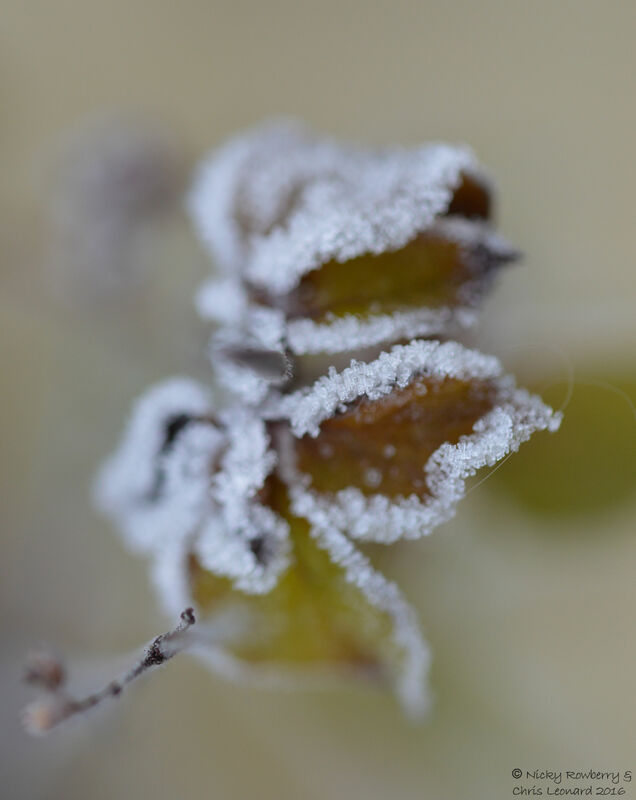 I always love the first good frosts of the year. They transform the garden into something magical, giving everything a crystalline coating that sparkles in the sunshine. Last year we hardly had any decent frosts, but this week November’s wintery breath has dressed our garden in delicate white lace. Winter is coming! 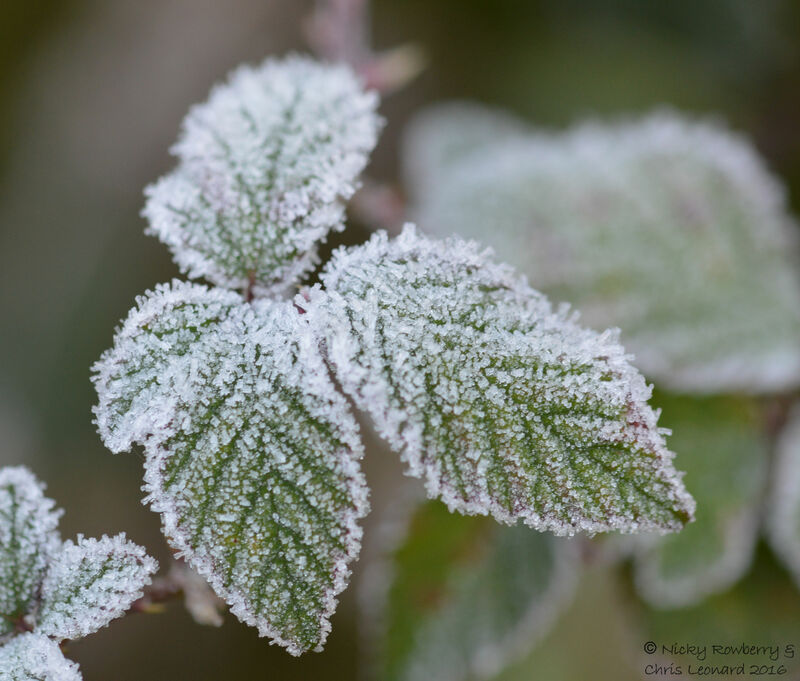 The thermometer registered that it had dropped to -4.7C in the garden last night, so I went out this morning armed with multiple layers of clothing and a thick woolly bobble hat. 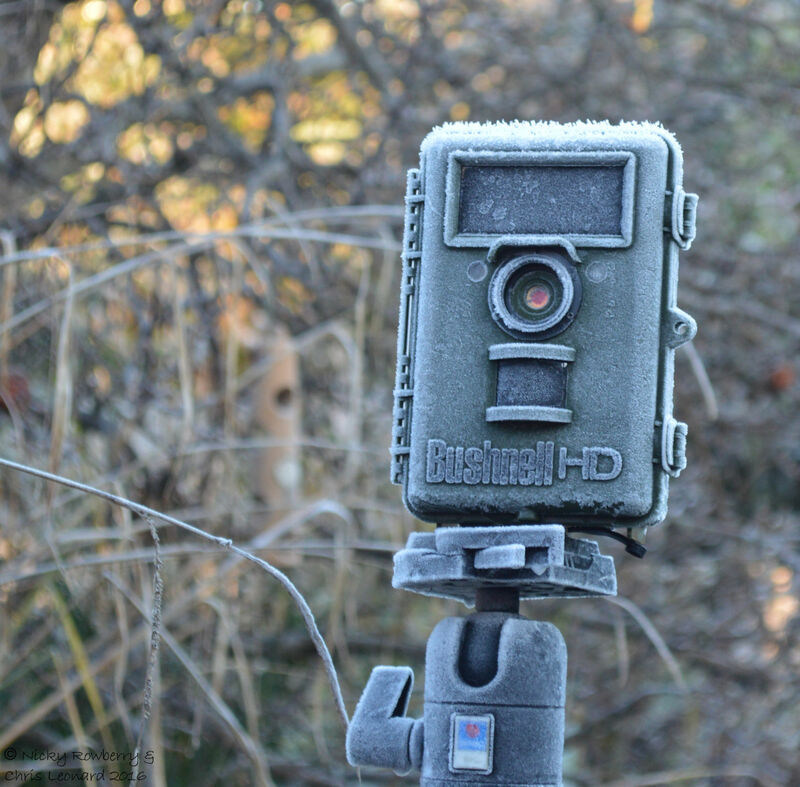 The trail camera had been foolishly left out overnight and was not only frosted, but the tripod was frozen solid to the ground. 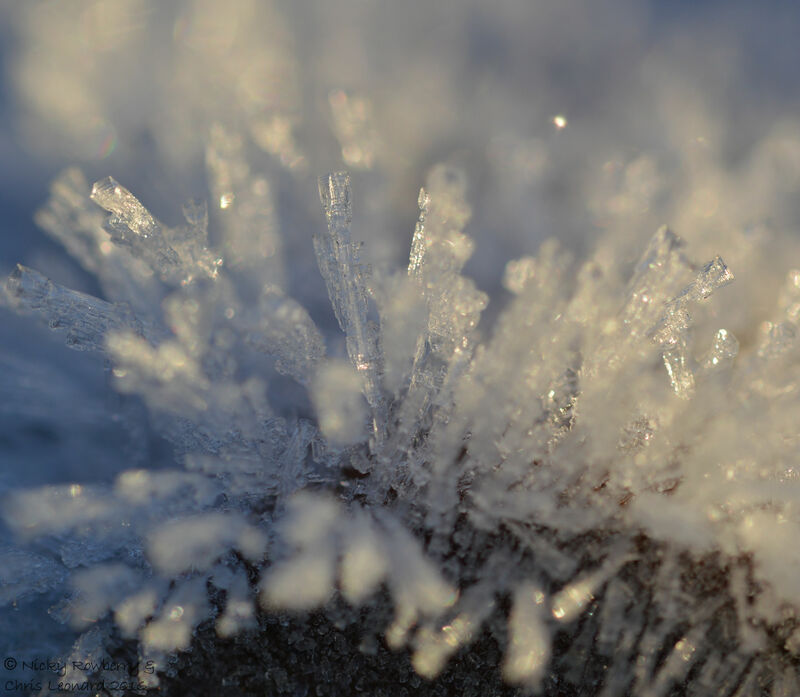 After a brief but strenuous battle I managed to wrest it from the garden’s icy grip, so that I could use the tripod for my frosty photos. 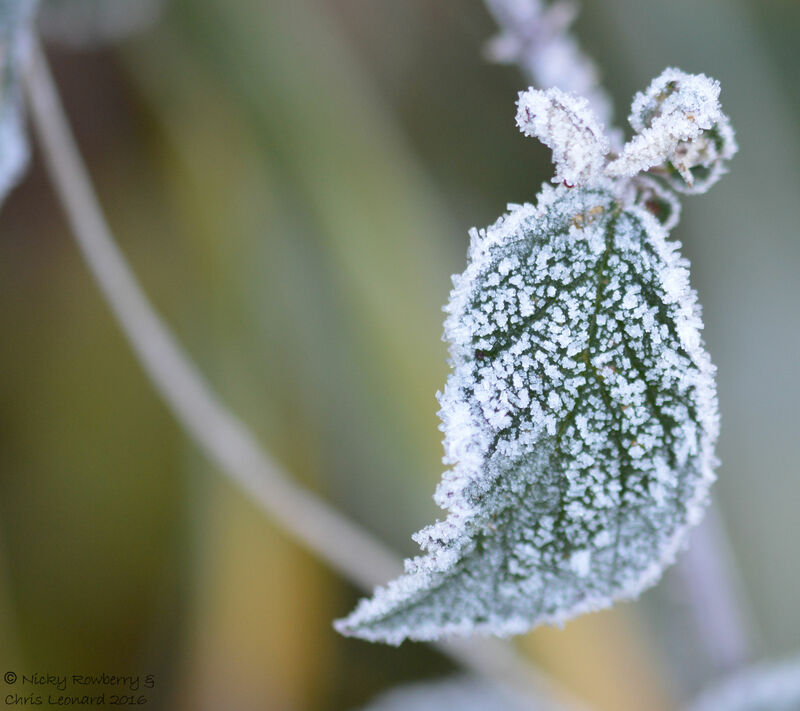 I’d gone out into the garden hoping for spiders’ webs glistening with icy beads, or red berries frosted on the bushes, or icicles dripping from a branch. Of course I couldn’t find any of these things, but what I did find was just as good. We have a small flimsy porch type thing around our back door with single layers of glass. These were covered in beautiful “fern frost”. Window frost like this used to be much more common before the advent of double glazing. 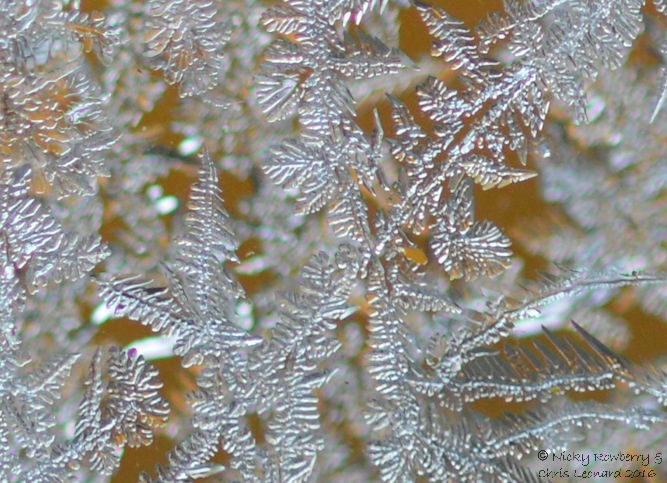 Double glazing restricts the contrasting temperatures needed either side of the glass for the formation of this type of frost. Our tatty little porch is not normally a thing of beauty, but this morning Jack Frost had transformed it with these feathery fractal patterns. A wooden garden chair had also been left out last night and was now covered in hoar frost. 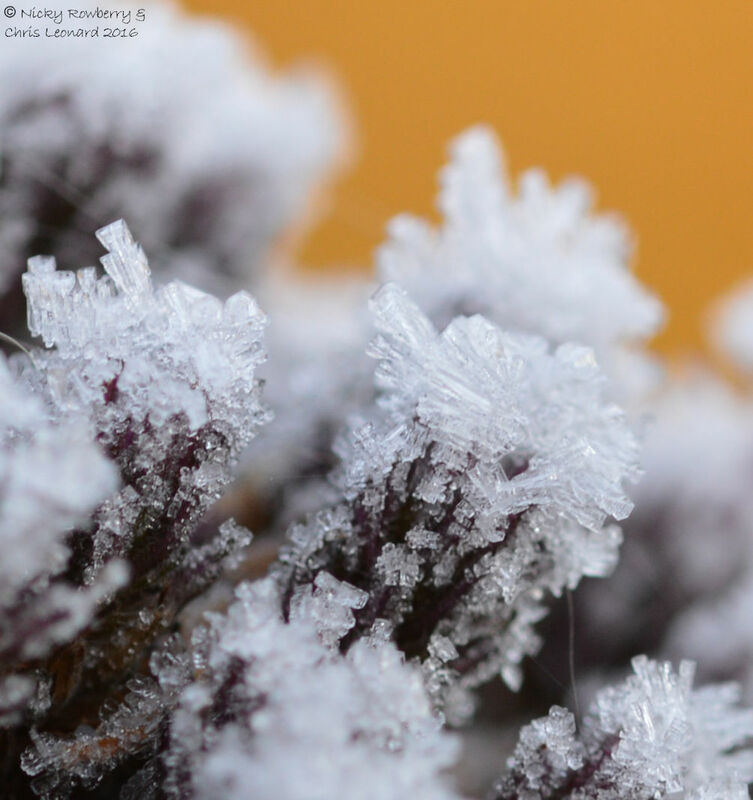 Hoar frost forms white crystals of ice that coat everything with a sugar-like dusting. The frost on the chair was really quite thick – up to a centimetre in places, looking like icy white fur. 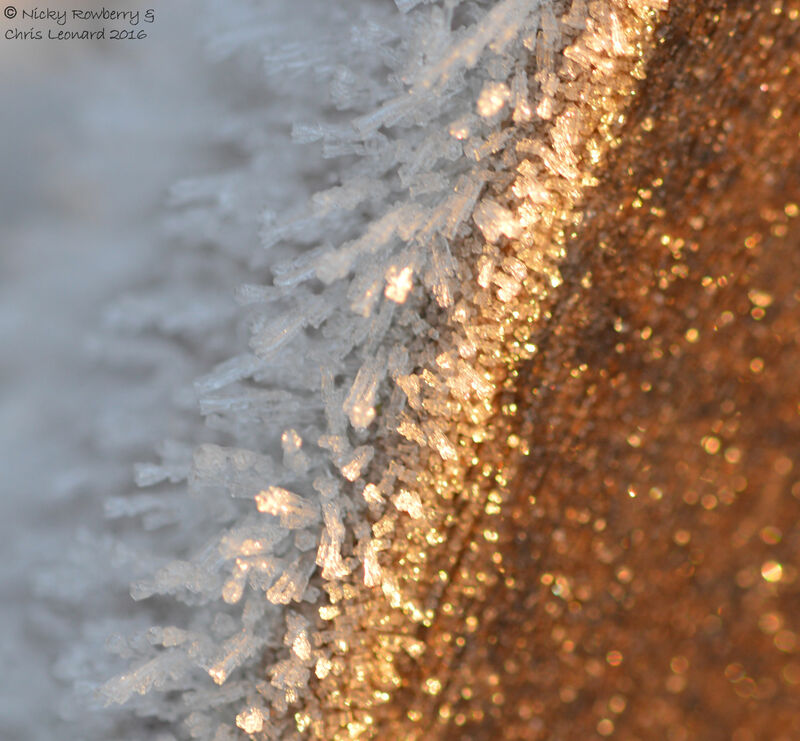 I loved the way on one side of the chair the frost had started to melt and sparkled like golden glitter, while on the other side it was still silvery white. The grass was lovely and crunchy under foot; it seemed a shame almost to trample it as I snooped around the garden. Leaves everywhere were of course covered in the ice crystals, looking like they’d been dipped in some frenzied attempt to candy coat the whole garden. 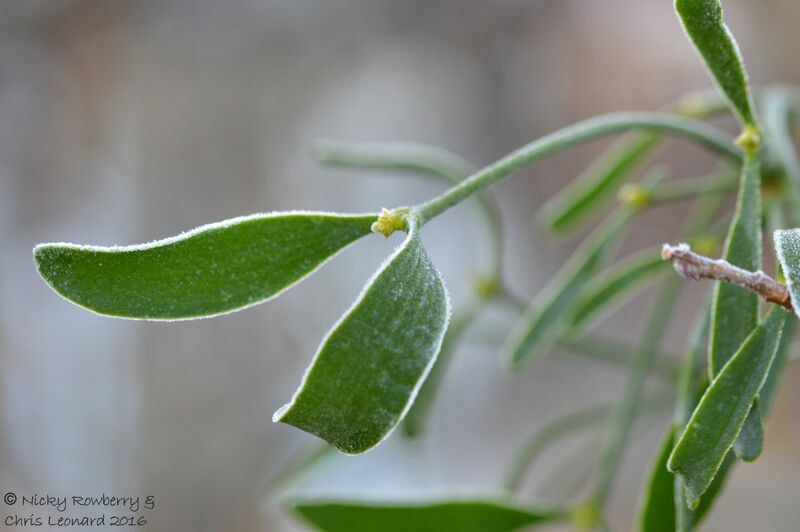 The presence of the mistletoe (visible again now the leaves have fallen off the apple tree), made it feel quite Christmassy (reminding me that I need to go in and give the Christmas cake another good soaking of brandy!). 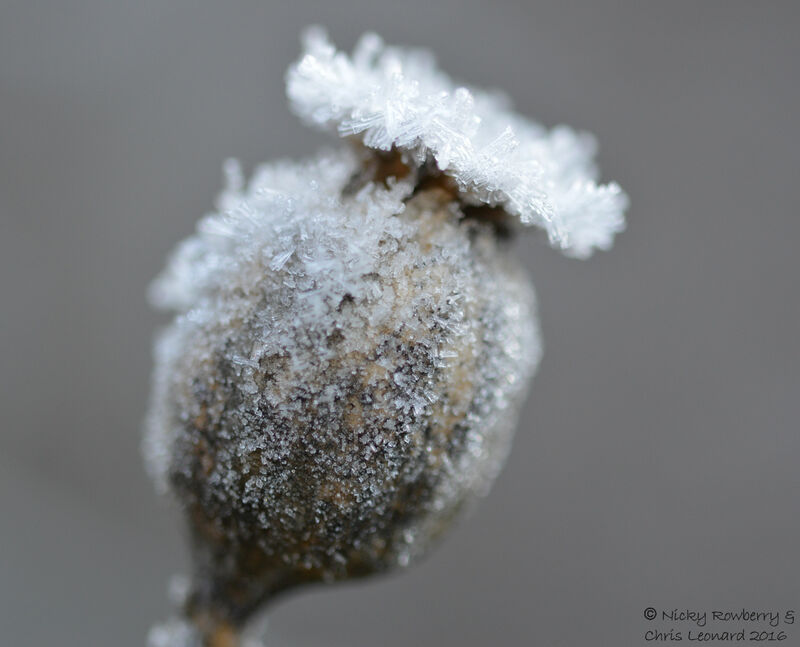 I found a poppy seed head, which looked great from the side, but even better from above – like a tiny diamond encrusted crown. 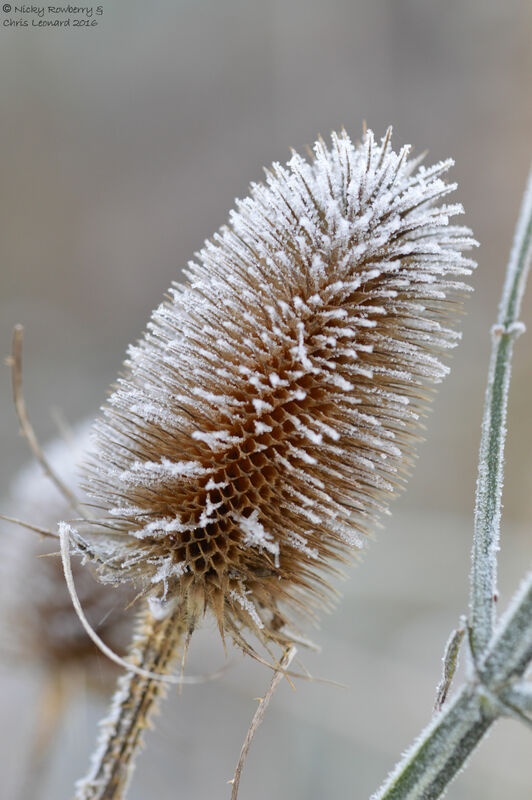 I can never resist taking a photo of the teasels. 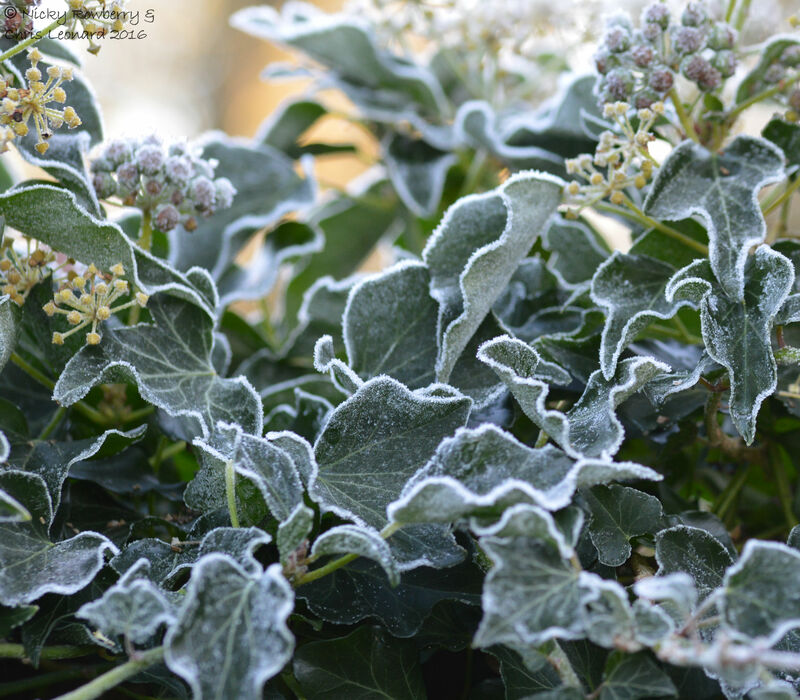 The frost on them actually looked more like snow, being much finer for some reason than that around the rest of the garden. There were a few splashes of colour amongst the wintery white. 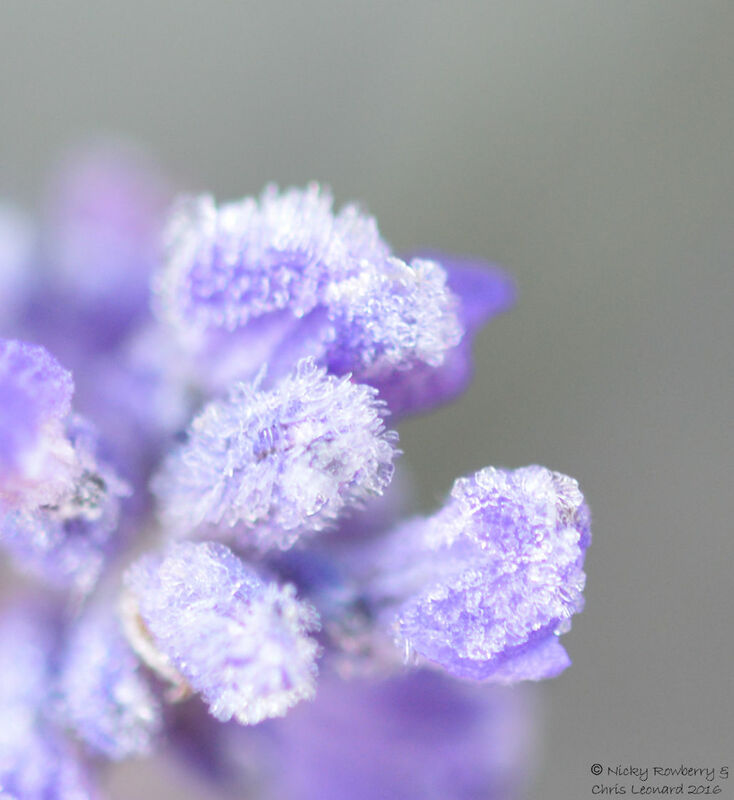 We have one patch of lavender that had still been flowering, long after the rest in the garden had finished. I suspect the frost will have put an end to that though. The Verbena bonariensis that I grow in the hope of attracting butterflies (with little success) was clearly a frost magnet. 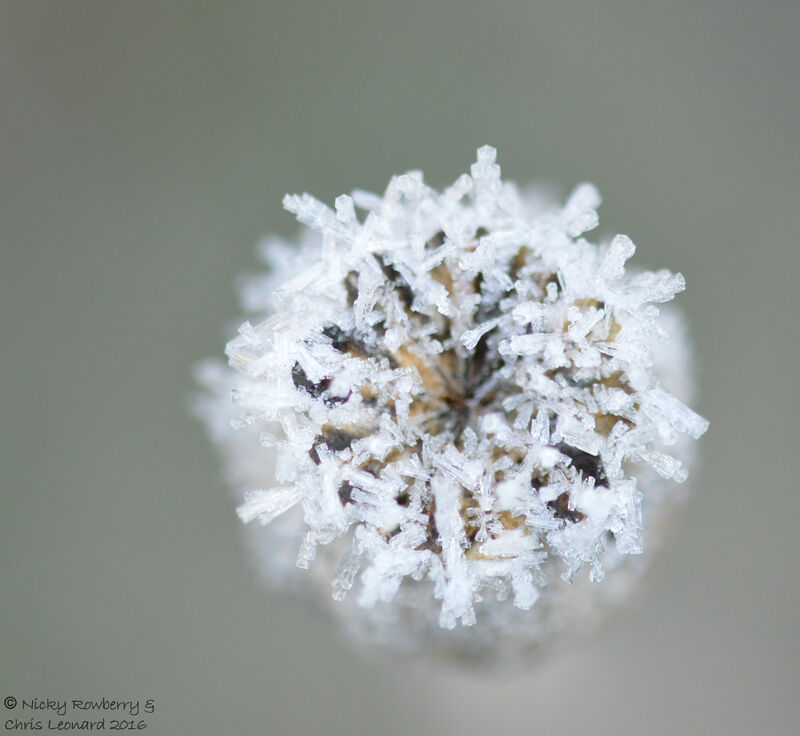 Chunky little crystals were stacked up all over the old flower heads. Possibly my favourite snap of the day was of this brave little flower, still glowing yellow in the morning sun despite its diamond coating. 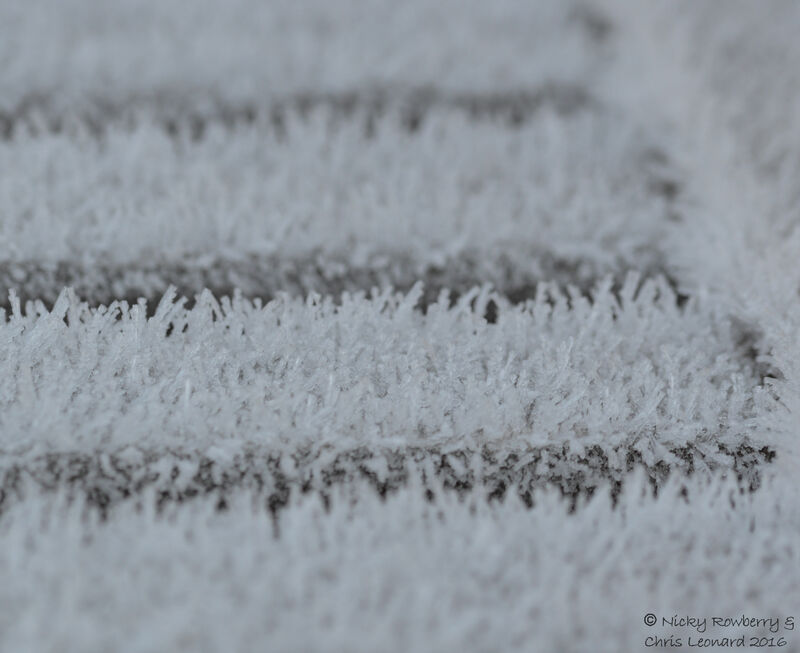 I thought it would only take me a few minutes this morning to photograph the frost, but when I came back in I found I’d been out there for an hour. It was just so beautiful and peaceful, I hadn’t noticed the time go by. I did have a moment of panic while I was downloading the photos, when I realised there were absolutely no birds to be seen in the garden. We normally have hoards of them, especially as I’d topped up the bird feeders while I was out there. 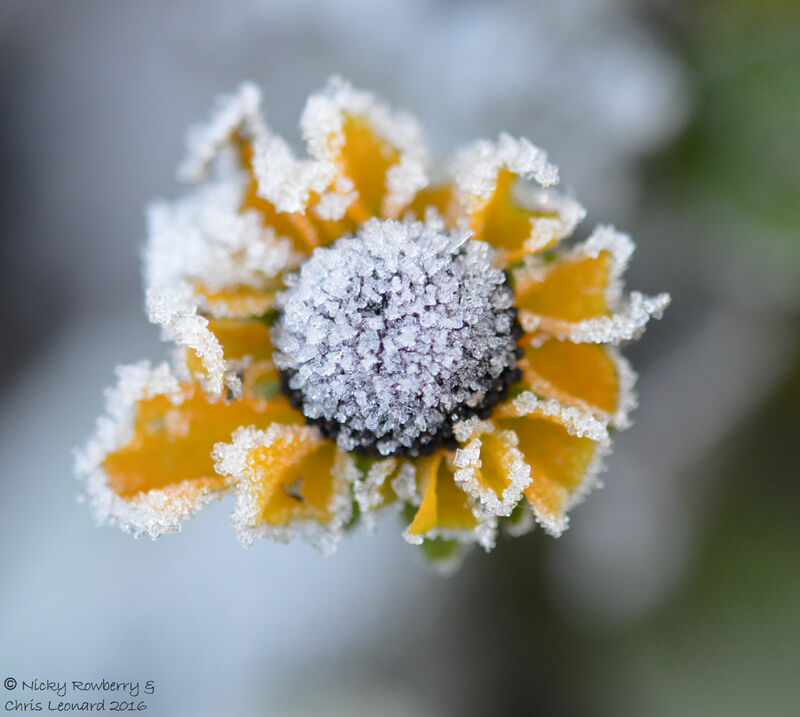 I had this sudden irrational fear that the frost had killed them all off! (I know it made no sense, as there’d be no birds anywhere if one frost could kill them that easily!) Very quickly though they reappeared – they’d probably all just been traumatised by the sight of me and my bobble hat so early in the morning and taken a few minutes to get their nerves back!! Getting there. Feels like my head is full of cloud lol my whole family have been struck down with it!